We regret to announce that this program will NOT be offered in 2019. Please check back for further updates. Thank you! TRAIL QUEST 2018 - Big Changes! Please Read! Congratulations to all who have participated in Trail Quest during the past five years! It was not an easy task to complete the Quest, but many of you did. We hope we opened your eyes to the large number of wonderful horse trails Wisconsin riders enjoy. Trail Quest will be changing for 2018....we have made markers, (see photo) that will be placed on Wisconsin's horse trails for the summer of 2018. All you have to do is pick up the marker you find while trail riding. You then bring it to the Wisconsin Horse Council Trails booth at the 2019 Midwest Horse Fair to exchange the marker for a gift. RULES: You must be a member of the Wisconsin Horse Council to be eligible, and you must be available to pick up your award at the Midwest Horse Fair April 2019. Easy enough? We hope that you enjoy the hunt for the markers. Good luck to you all! If you have any questions or concerns, please contact Kricket Jewett kricketj@gmail.com. Congratulations to all of the WHC Trail Quest 2017 Award Recipients! Picture above from Left to Right: Past Trail Quest Program Director, Carrie Quatsoe with Sharon Phimister and Sandy Misco. Sharon is the only person who successfully completed Trail Quest all five years. Sweeney's Western Wear provided a special award for this accomplishment. Pictured above from Left to Right: Past Trail Quest Program Director, Carrie Quatsoe, Peggy Butler and Patty Wisneski. Congratulations to 2015's Trail Quest participants! Thirteen people completed the Quest and received awards for their perseverance. This year's award was an insulated coffee mug decorated with the Ride Wisconsin logo and a picture of the rider with their horse. Below are a few pictures of some of the award recipients. 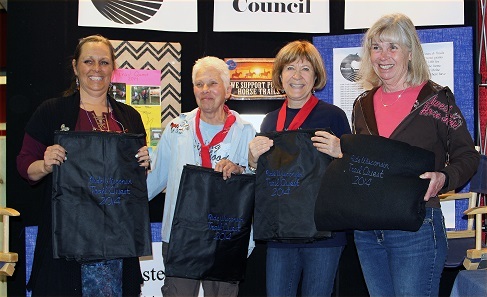 ABOVE: Sue List, Carol Reinhard, Carrie Quatsoe (past program director), Sharon Phimister, Irene Petrik, Sandy Misco, and Peggy Butler. 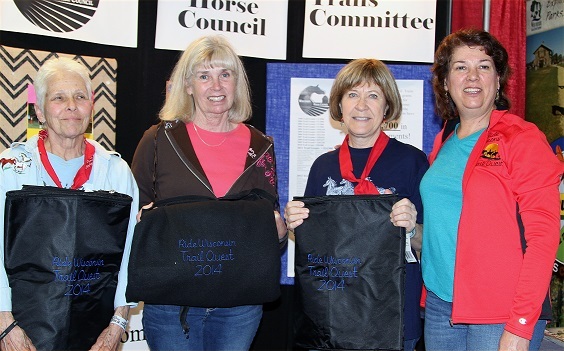 Here are some of the Trail Quest award recipients from 2014...Congratulations!